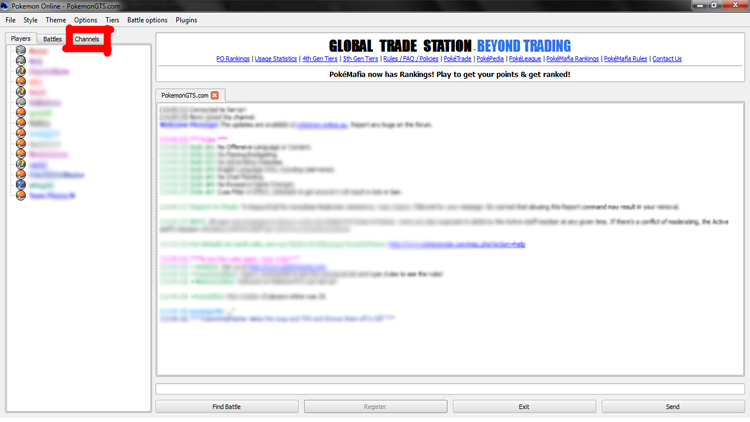 PokÃ©mafia is an online game exclusive to the GTS Pokemon Online server. 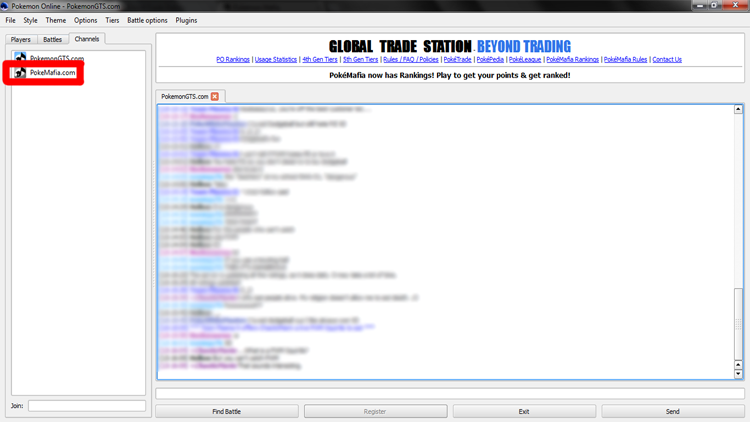 Signing up and logging into the GTS server on Pokemon Online. Then, double click on PokeMafia.com in the listing. Now that youâ€™re on the PokÃ©mafia channel, itâ€™s time to learn the rules of the game. Anyone can start a game. All you have to do is enter the Mafia channel and type in /start. That starts a game. The basic goal: There are 3 teams of the game: Towns People, Neutral, and The Rockets aka "Mafia". Neutral players have a choice of which side to choose. So once either all the townsâ€™ people or all the Rockets have been eliminated, the remaining team wins. However, if all Rockets AND Towns people have been eliminated, then the neutral team wins.Please note that if your team wins, itâ€™s only the remaining players that havenâ€™t been voted off or killed that win, not the entire team. If you were to break any of these rules, it could cause you to be banned from the pokemafia game, from the GTS server, and/or an infraction on the GTS website. Rookie Trainer; The Rookie Trainer is a town civilian. Rookie Trainers can only wear up to 3 bulletproof vests, 1 per night to protect themselves from attacks. Wear the vest by using â€œ/vestâ€ at night. Professor Oak; Professor Oak is the town's Mayor/Leader. With the ability to increase his/her vote count by 3 times more than a normal user & has 1 vest to use. Sheriff Jenny; An investigator role. Investigators can check one person per night by using â€œ/inspect (insert name)â€ at night. Officer Jenny; See Sheriff Jenny. Detective Looker; See Sheriff Jenny. Nurse Joy; Nurse Joy is the doctor and can heal/save one person per night that he/she targets. Black Belt Trainer; Black Belt Trainers can bodyguard other people by using â€œ/protect (insert name)â€ in the night. But only one person per night, and will die protecting his or her target if that target is attacked. However the attacker will die along with the bodyguard. Gligar-Man; Gligar-Man will take justice upon themselves, and "kidnap" or "kill" the ones he or she may suspect as Mafia & as the Burglar by using the â€œ/kill (insert name)â€ command at night. Dragon Master Lance; Lance, the Dragon Master is the town's Veteran Trainer. If approached by anyone at night, it's an automatic death to that person. There are no special commands. Clown Trainer; A Clown Trainer is a neutral role with the objective to get lynched (or voted out) by the town. If successful, one random person out of the voters will die overnight in guilt of the Clown Trainer's death. If the Clown Trainer dies over night or lives when the game is over, then the Clown Trainer has failed and loses. Burglar Trainer; A Burglar Trainer is a night thief that seeks to steal at night, but can never be stealth about it and will end up "kidnapping" or "killing" his/her target by using the â€œ/kill (insert person)â€ command. A Burglar cannot die at night. Psychic Trainer; A Psychic Trainer can use his/her abilities to control other user's roles. This can only be done once per night by using the â€œ/control (insert name)â€ command. Rocket Giovanni; Rocket Giovanni is the Godfather and can select one person to kill per night using the â€œ/kill (insert name)â€ command. The Godfather cannot die at night. Rocket James; Rocket James is a framer that can "frame" innocent people into appearing like they're in the Mafia by using â€œ/frame (insert name)â€. This causes any investigator role to see that this person is a threat, even if itâ€™s not true, if inspected during the same round. Rocket Jessie; See Rocket James. Rocket Meowth; Rocket Meowth is a Consigliore that can investigate much like Sheriff/Officer Jenny & Looker by using the â€œ/inspect (insert name)â€ command, but does it for Team Rocket. Rocket Butch; Rocket Butch is the Mafioso, which can "suggest" who to kill, and will inherit become Godfather if Godfather gets lynched. Butch has no special commands at night unless Giovanni is killed, in which case can use the â€œ/kill (insert name)â€ command. Rocket Cassidy; Rocket Cassidy is a Blackmailer & can "blackmail" one person per night by using the â€œ/blackmail (insert name)â€ command. It will silent the user & prevent them from voting for that turn. If any of the other rockets try to use the â€œ/killâ€ command, it will tell you which of the Rockets is still in charge. So, the night is over, and people may or may not be dead. First, talk amongst the other players and decide who you want to kick out. Once 60 seconds of that have passed, itâ€™s time to vote. In order to vote someone out, they need to collect the highest number of votes. If there is a tie, no one is kicked out of the game. To vote, all you need to do is use the â€œ/vote (insert name)â€ command during the voting period. This period only last 60 seconds so you have to be quick. (13:54:02) +Game: Type /Join to enter the game! (13:54:05) +Game: Hurricane joined the game! (13:54:06) +Game: liquidsteel joined the game! (13:54:08) +Game: shtephh joined the game! (13:54:20) +Game: djluis204 joined the game! (13:55:00) ChaoticMarin joined the channel. (13:55:02) +Game: Hurry up, you only have 60 seconds more to join! (13:55:05) +Game: ChaoticMarin joined the game! (13:55:32) +Game: Hurry up, you only have 30 seconds more to join! (13:56:02) Current Roles: Burglar Trainer, Officer Jenny, Professor Oak, Rocket Giovanni, Rocket James, Rookie Trainer. (13:57:02) Current Roles: Burglar Trainer, Professor Oak, Rocket Giovanni, Rocket James, Rookie Trainer. (13:57:02) Current Players: Donald, Steve, Tomato, brofist, farts Mcgee. (13:57:36) Tomato: Oak didn't die. I find this noteworthy. (13:57:56) Tomato: So, there were two killers but only one death. (13:57:59) Tomato: anyone get attacked? (13:57:59) farts Mcgee: who is bad and who is good? (13:58:02) Current Roles: Burglar Trainer, Professor Oak, Rocket Giovanni, Rocket James, Rookie Trainer. (13:58:02) Current Players: Donald, Steve, Tomato, brofist, farts Mcgee. (13:58:31) +Game:farts Mcgee voted for Donald! (13:58:38) +Game:Steve voted for Donald! (13:58:39) +Game:brofist voted for Donald! (13:58:46) Current Roles: Burglar Trainer, Professor Oak, Rocket James, Rookie Trainer. (13:58:46) Current Players: Steve, Tomato, brofist, farts Mcgee. (13:59:46) +Game: The Burglar Trainer (ChaoticMarin) wins! (13:59:46) +Game: The Town People (Hurricane) lose!